First things first, Cinco de Mayo is not a day. In fact, as a Mexican-American with more than half of my family still living in Mexico, when the date comes around I don't think I receive a message even mentioning it from any of them. Every once in a while, though, a cousin finds humor in sending us screen shots of tweets or memes that mirror the ignorance in the celebration: "¿Ya se fijaron que hoy se celebra la independencia de México en los Estados Unidos? Jaja." Translation: "Did you see that the US is celebrating "Mexican Independence Day" today? LOL" Sounds about right. So, when is Mexican Independence Day then? Sept. 16. And what do we celebrate on May 5? The Mexican army's 1862 victory over France at the Battle of Puebla. While this victory didn't free Mexico from the French (this would happen months later), it did represent a great win for the country. Outnumbered and with poor supplies to fight the war, this triumph gave Mexicans hope, and the date evolved into a celebration of pride and culture. 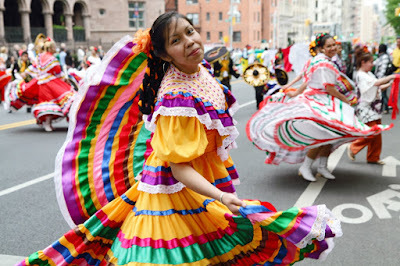 Yes, the country does acknowledge Cinco de Mayo, but it's mostly only celebrated in the state of Puebla and nowhere near as big or similar to how the festivities take place in the states. The $2 margaritas, two-for-one tacos, and wear-your-sombrero-to-work traditions will most likely only happen here on Cinco de Mayo, not south of the border. Cinco de Mayo symbolizes unity and hope for the country, so how did the day evolved into what it has in the US? At some point, Mexican-Americans (or chicanos) adopted the day and began celebrating it. The idea was for them to promote their culture, history, vibrant colors, and musical diversity at a time where they felt oppressed. Now, instead, the meaning of Cinco de Mayo is a big confusion for most and a sales and marketing target for brands. With Mexican roots, I take any opportunity to feel pride in my culture and ancestors.I do celebrate the day and victory. I will proudly congratulate my country with a tweet or Facebook post and maybe wear the rebozo, huipil, or embroidered shirt I purchased on my last trip to Jocotepec, Jalisco (that's where my family is from). However, I will also feel saddened by the fact that most won't acknowledge the date's symbolism appropriately. Instead, I will most likely have to hear incorrect statements made over and over again and plenty of "Yeah, I'm down for Drinko de Mayo and tequila shots! Viva Mexico!" from people mocking the commemoration and everything I stand for. Cinco de Mayo isn't the only day that has evolved into an alcohol-driven fiesta, there are others. Will my frustration change anything? Probably not, but I do hope eventually, if we spread knowledge, we'll embody "culturas" for what they are; not only mine, but all. I am no one to pass up a two-for-one taco special, but it would be nice to come across a Cinco de Mayo where I don't have to hear of foolish behavior being broadcasted on national television for others to repeat or mindless comments allowing stereotypes to live and continue. Imagine, what would a Cinco de Mayo then look like? Sounds like a better holiday to me.